If the Era of Animal Dignity is dawning, we need a new word for it. Something like “humanism,” but better. The term “era of animal dignity” came from recent commentary by Frank Bruni of The New York Times. However, I have for some time been aware of its dawning in my emails. The people I communicate with could be unusual in this respect, but maybe not. I bet this is happening all over. I refer to the stunning photographs of all sorts of creatures, both wild and domestic, flowing through the Internet. They are touching, breathtakingly beautiful, comical, and educational. Countless times I have stared in wonder at an insect, fish, animal, or bird I didn’t even know existed. From that wonder arises the desire to protect and preserve. In a very troubled world, this seems a promising trend. There is hope in these images as well. 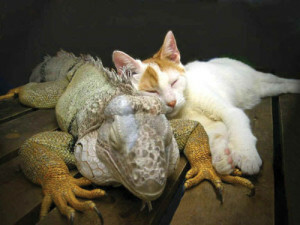 I refer now to the rising tide of photographs of cross-species friendships, and the message seems pointed. 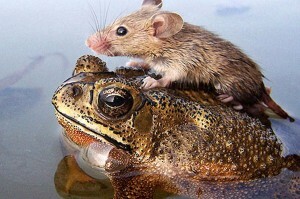 When we see a photograph of a frog rescuing a rat from a flood and a cat cuddling a giant iguana, we can’t help but think that there may be some way for Democrats and Republicans to work things out. Total annual revenues from pet products and services is close to $50 billion, and growth is expected to hold at 4.4% through 2016. Among other things, this is apparently due to the perceived health benefits of an affectionate companion that also needs exercise. The combination may lower blood pressure and the risk of heart disease. According to the American Pet Product Association, pet ownership has expanded from 56% of households in 1988 to 62% today. Dogs count for 18.9% of pets and cats for 22.7%. Freshwater fish are at 41.7% in a chart that also includes horses, reptiles, and birds. My dentist has a lot of fish swimming around in tanks. I have to say that the sight is soothing when you’re being worked on, and they’re probably not too much trouble. Maybe I should get a couple, although I feel pretty calm. Cats have become an especially popular topic of conversation recently due to a book called Cat Sense by a British biologist, John Bradshaw. He tries to clarify the feline mind, which would be good. In the images coming across my email, the kittens are adorable, but the adult cats often seem to suggest a raised middle finger. I don’t know much about cats, but I am looking forward to going out to my sister’s place to visit her two. I have assumed that I have a good relationship with them, but the Bradshaw book says that a stiff tail is a reliable sign of affection. I hope my feelings aren’t hurt by a curl. And I learned that they don’t eat the prey they bring dead into the house because cat food tastes better. They are very smart. Our interest in really understanding our pets could be interpreted as a reassuring sign of human evolution. Of course we will still have this tendency to project aspects of human personality and sensibilities. This is visible in the new style of dressing pets in costumes–sunglasses, booties, sweaters, hats, pinafores, etc. One wants to be careful about offending or embarrassing them, though, and I have an example of such a transgression. The story was shared by a psychologist. She is extraordinarily sensitive and developed her perception for a while by training as an animal communicator with a veterinarian who was gifted in this manner. In one exercise, the vet gave her a photograph of her majestic greyhound and directed the psychologist to make several requests of the dog. One was to share something unique about it that the vet would know. In an instant, the psychologist had a vivid, fleeting image of the stately animal in reindeer antlers with something red at the chin. The dog looked silly and its discomfort was palpable. The vet was delighted with this insight and confirmed its validity. A friend house-sitting for her at Christmas had, in fact, dressed the dog up in antlers and taken a photograph. The tale was indeed cautionary. If the effort to understand our animals is sincere, there will be times when we find ourselves in the presence of a creature of exceptional standing. In my own case, for example, I realized one day that the beautiful Samoyed that was my companion for fourteen years was a better dog than I was a person. It was a thought that gave me pause and raised the bar somehow. As all these beautiful and touching images of our fellow creatures continue to flow through the Internet, respect, empathy, and concern will continue to develop. As I said at the outset, we need a new word for the exciting transformation afoot. I’ll try to think of a possibility, but I would also welcome suggestions.